DJ Jackman Wolf is your host for this hip and happenin' lesson in the two R's: Rock & Roll. Sing, dance and laugh along as your Sesame Street friends phone in their favorite music video requests: Bert digs "It's Hip To Be Square". The Count's #1 favorite "Count Up To Nine" and Oscar's grouchin' and groovin' to "The Word Is 'No'". But wait, that's not all! You'll also get Grover's "Monster In the Mirror," "Rock N Roll Readers" by Chrissy and the Alphabeats and many, many more. 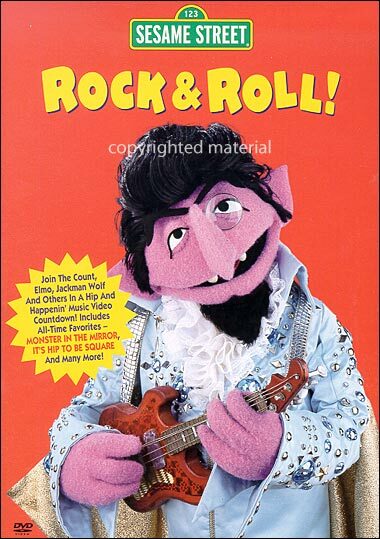 Kids from 1 to 91 will love the sizzling sounds of Sesame Street's Rock & Roll.